Is it possible to make ice melt faster? 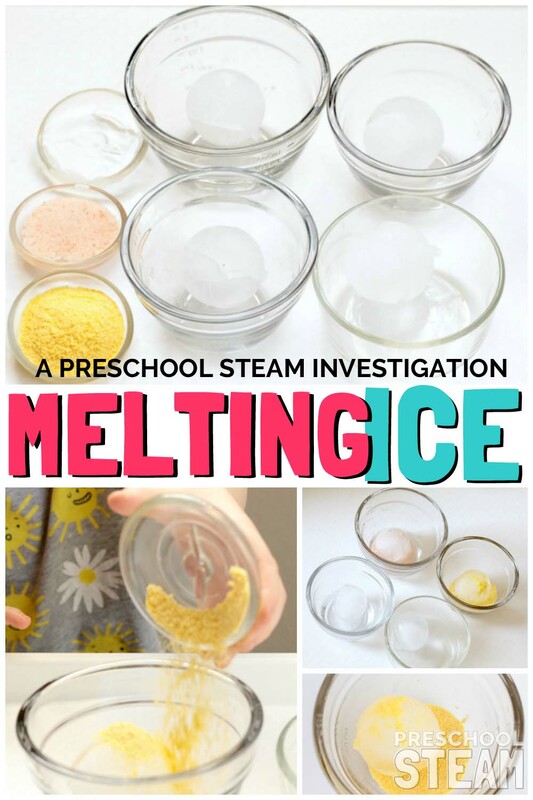 Investigate the properties of ice with this hands-on science activity for preschoolers. 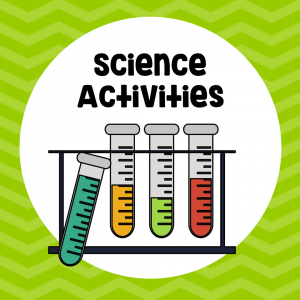 Objective: To learn about ice and why some materials make ice melt faster and others keep it from melting. 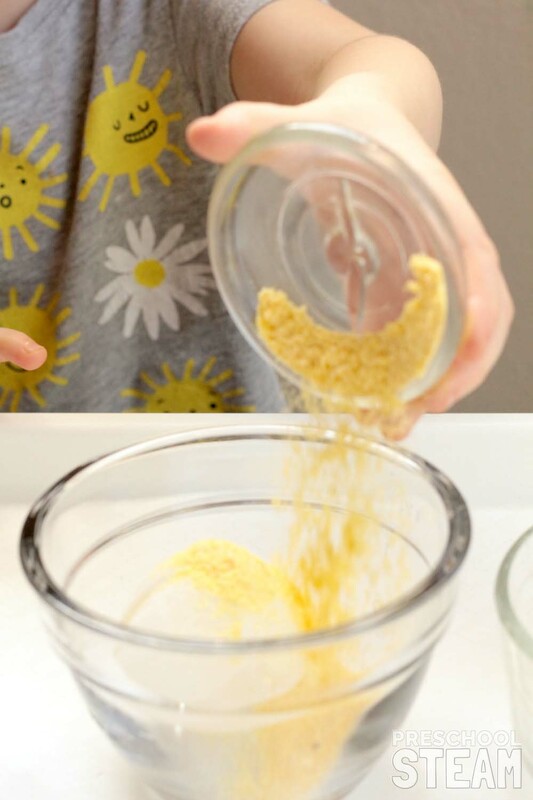 Materials: Large play tray, 4 small containers (or more, have as many containers as you do ice cubes), ice cube tray, salt, corn meal, measuring cups, and flour. 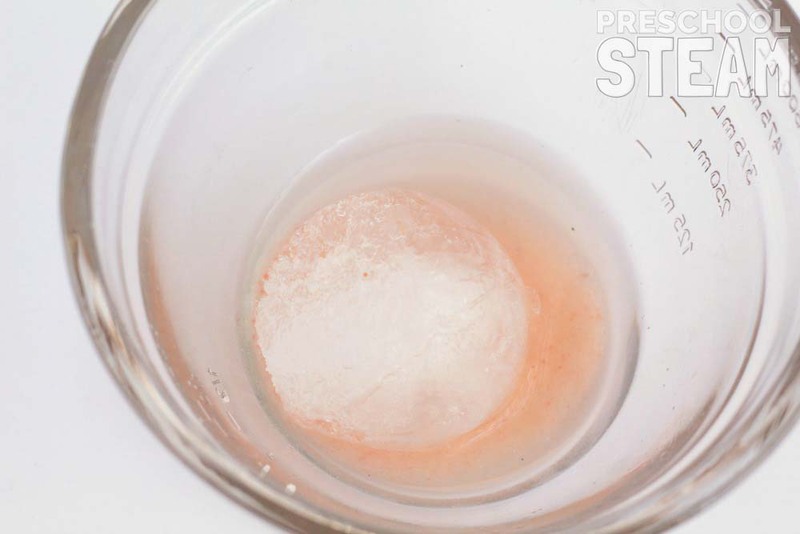 Ask: Do you know what makes ice melt? What material do you think will help ice melt faster? 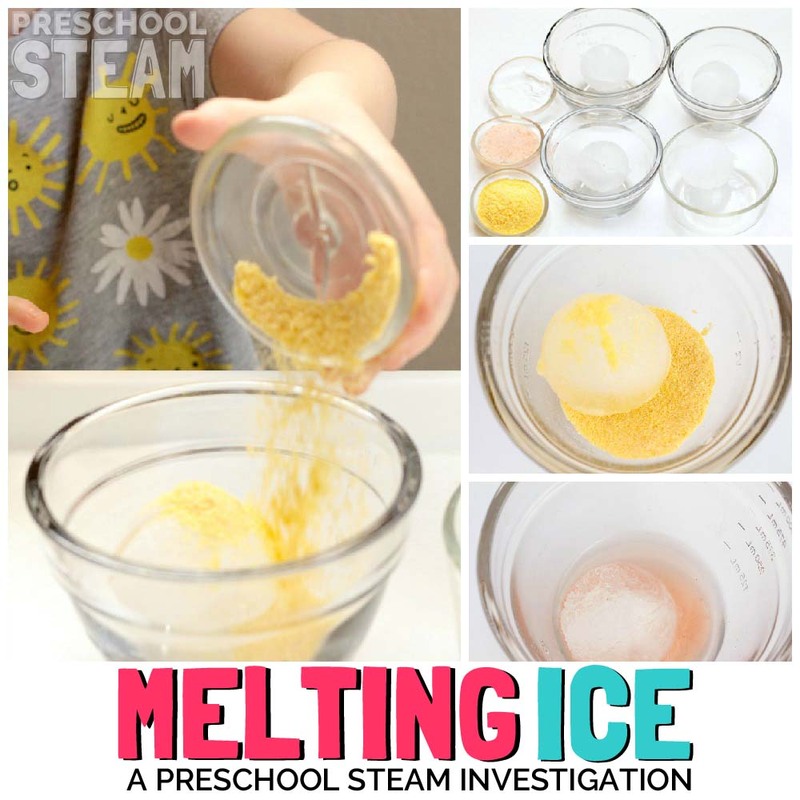 Learn: Preschoolers will learn how different materials either insulate ice, or cause it to melt faster by reducing the temperature of ice faster or lowering the melting point of ice (in the case of salt). 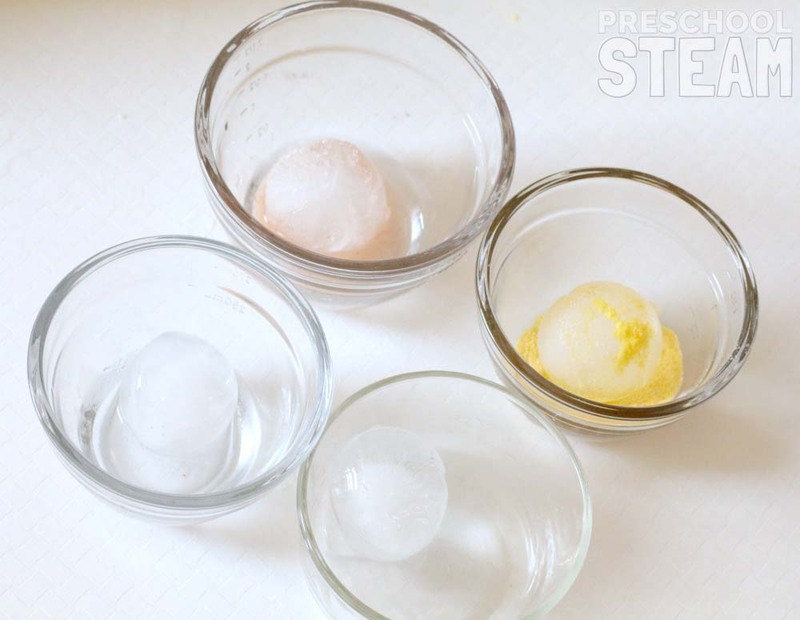 Place one cube of ice into each container. You will want to use as many cubes and containers as you have materials to test. 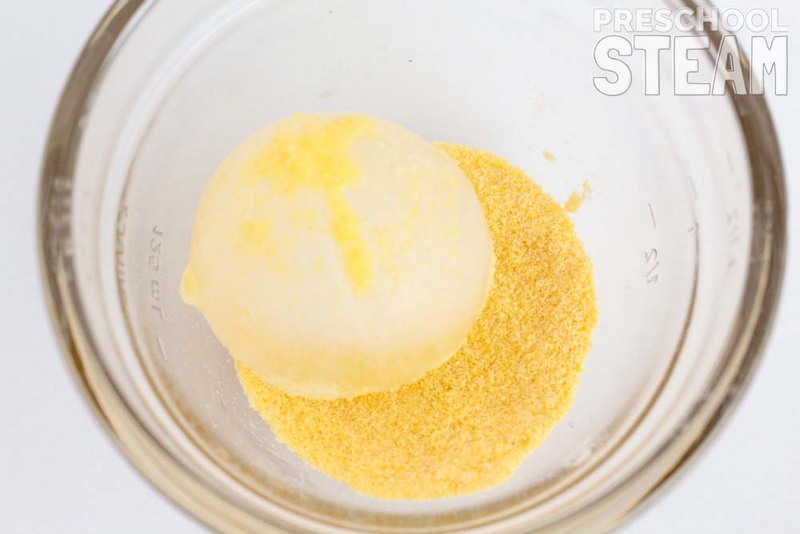 We tested cornmeal, nothing, water, and salt. Instruct the preschoolers to measure the same amount of each material to add to each container. Set a timer for 15-20 minutes. After the timer goes off, examine the ice cubes. Which cube melted the fastest? Which melted the slowest? In our experiment, the salted ice cube melted the fastest, but the cornmeal helped insulate the cube and it melted the slowest. Science: Some materials have insulating properties (flour, cornmeal), and others will make ice melt faster (water, salt). Kids will learn about the freezing point of water, and what happens when different materials touch ice. Technology: If desired, use a digital thermometer to test the ice’s temperature right out of the freezer and after spending 15 minutes in the material. 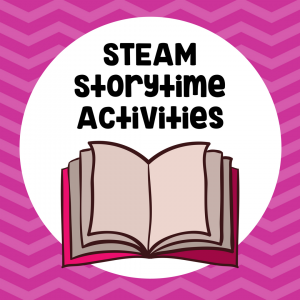 Engineering: Preschoolers will learn the basics of material construction and when they might want to use an insulating material or a dissolving material. You could talk about instances where engineers look for ways to prevent ice formation and when they try to encourage it. 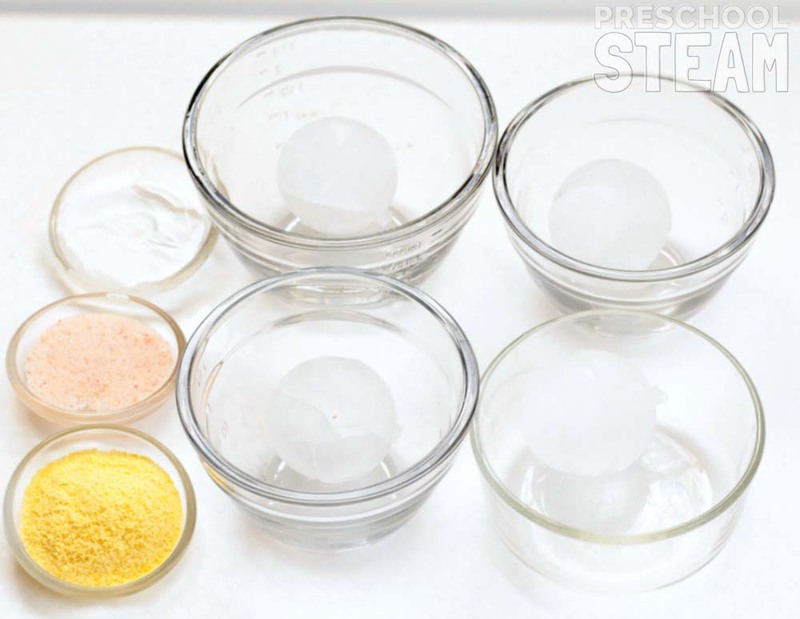 Art: Add food coloring to the ice to make it even more colorful and highlight the differences in melting speed. What happens when two different colors melt together? Math: Measure the same amount of material for each container.